NBC Sports made Kansas City the center of the sports world over the weekend. KANSAS CITY, Kan. — Kansas City is the true crossroads of America. And for one day, the Chiefs and NASCAR intersected in the same place. The Monster Energy NASCAR series raced it's Hollywood Casino 400 playoff elimination race at the Kansas Speedway early Sunday afternoon. Chase Elliott won the race on Sunday. It was his third career win and his second win in the NASCAR playoffs. Things shifted to Arrowhead Stadium where the Chiefs hosted the Cincinnati Bengals on NBC's Sunday Night Football. The Chiefs (6-1) dominated the Bengals (4-3) winning 45-10. However, during the weekend festivities, both racing and football were on the minds of people around the city as well as the track. NASCAR on NBC analyst and former driver Jeff Burton talked with 41 Action News about the significance of Sunday's race at the Kansas Speedway. "We are knee deep in our playoff season. And now, it's do or die. [Prior to the race, you had] four teams on the outside looking in with one race to go. And, they [had] to make it happen," Burton said. "If they do not make it happen, their year is over in regard to winning a championship. So, [it's] a lot of pressure on people." SNF on NBC sideline reporter Michele Tafoya had arguably the most unique experience of the weekend. Prior to the football game, she went to the Kansas Speedway and hopped in a NASCAR race car for the first time ever. Jeff Burton drove her, around the track, in a ride along session at speeds upward of 185 miles per hour.
. @snfonnbc ’s @Michele_Tafoya is getting ready for a ride-along with @JeffBurton at @kansasspeedway ! "It is like nothing else. The speed along the wall was amazing," Tafoya said. "[SNF on NBC color commentator] Chris Collinsworth told me, 'You don't wanna go 190.' Collinsworth, I went 180," an excited Tafoya said as she looked into the camera seemingly as if she was talking to him directly. 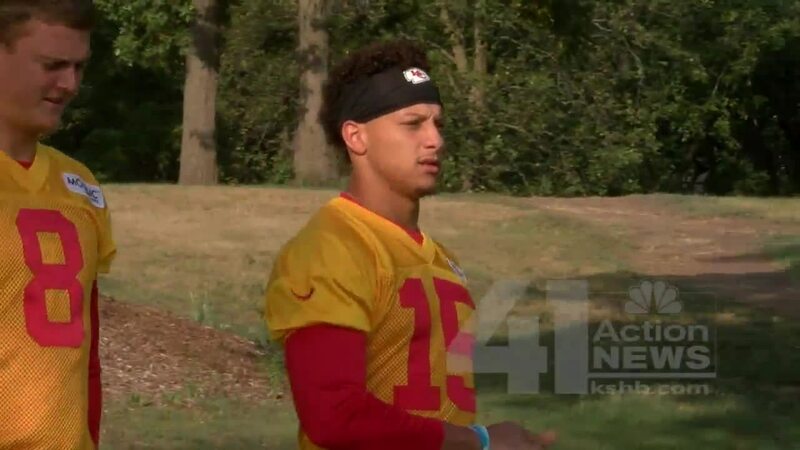 During her interview with 41 Action News, she also took some time to talk about the new Chiefs gunslinger—quarterback Patrick Mahomes. "Patrick Mahomes is—he's a young guy, 23 years old, so mature, and yet so instinctive," Tafoya said. "Some of the throws he makes, you saw the left-handed shovel pass against Denver. He's capable of doing things based on instinct. And, the coaches let him go. They don't say, 'No, no, no.' They say, 'Okay just feel your way.' So yeah, 'You see a little bit of [Brett] Favre in him too.'" While football is Michele Tafoya's job, it's simply fandom for former NASCAR driver turned NASCAR on NBC analyst Dale Earnhardt Jr. He is a self-proclaimed football enthusiast. "I love the NFL. I'm a huge [Washington] Redskins fan," Earnhardt Jr. said. "Ever since '81, '82, I've been watching the Redskins. I've been a big fan of theirs." Dale Jr. also talked about the Chiefs and how well they've been playing. "It's gonna be a great experience for us to watch the Chiefs. They're having a great season. They've got a great new quarterback that's lighting it up. And, the future is bright for that team. And so, it'll be fun to see what they can do," Dale Jr. said.